With CPA offer marketing… you can start making a bucket load of easy & fast profits online, even if you are the worst marketer in the world! And now, you can finally discover how to kick-start your CPA marketing business instantly with this brand new CPA PROFIT BLUEPRINT! Get Paid For Not Selling!? It’s made possible from a new wave of internet marketing that’s sweeping the world wide web known as CPA marketing. It’s kind of like affiliate marketing, where you refer people to a website with your referral link but the big difference is that the people you refer don’t need to buy anything! Meaning that you get paid not when a sale is made, but when the people you refer take an action. That action might be to sign up for a free trial or fill out a form or enter their zip code to get a free insurance quote for example. The best part (besides the huge income you can make) for you as a CPA marketer is that you don’t need to be a “pushy salesman” type of marketer to make money with it. Why Selling The “Traditional Way” Is Out? It’s getting tougher to “sell” stuff online by the minute! In this day and age where the economy is shot, people are holding on to their purses tighter than a swinging monkey holds on to branches. Have you been trying to make money the traditional way…and failing? You know the usual…” finding a product (ebook) to sell….then advertise it with your affiliate link….and hope for the best that someone will buy it”….type of approach. Well, you’d know as well as everyone that it’s dang hard to sell anything these days! It’s not only you…many marketers are feeling the effects of the bad economy. And it’s just natural that when people run out of money, they buy less and look for free stuff more. “FREE Stuff” Is Where The Action (and $’s) Is At! So why fight an uphill battle trying to flog a $37 ebook when there are more people looking for a free offer and you can get paid more commission for your efforts too!? CPA offers can earn you up to $25 and more per referral! You may think that you’d get squat commissions giving away a freebie…but you’d be surprised how lucrative CPA marketing can be. Whereas, CPA offers have been known to convert at a whopping 50% and more! Higher commissions, better conversion rates…why wouldn’t you promote CPA offers? Glad you asked because there isn’t a better time than right now to get into CPA marketing! While most marketers are still trying to ‘force’ sales and settling for 2% conversion rates, only a small few smarter marketers have discovered the money making the potential of CPA. That’s good news for you because it means that there is still plenty of room for you. And the faster you get into CPA the better. Some say affiliate marketing is the perfect part-time internet business for beginners…. But when you have a look at the benefits like those above, you can see why CPA takes the cake. Promoting CPA offer is not only extremely lucrative — it doesn’t take an expert marketer, a heap of training and hours slaving in front of the computer screen to make bank with it. That’s why it quickly got the attention of a lot of gurus who wanted to milk it for easy cash as much as possible and keep it secret from the little guys for as long as possible. But now, the secret is out. The way for you to rub shoulders and earn like a ‘guru’ too is to find a blueprint to show you the very steps to starting a highly successful CPA marketing business of your own. Well, look no further because you have come to the right place! 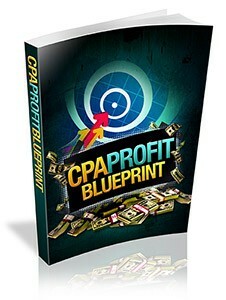 with CPA marketing revealed inside this A- Z blueprint! Download your copy now and discover how to go start from scratch and create a profit pulling CPA business of your own in 24 hours or less. Whether you’re a complete beginner or advanced marketer looking to create an extra “low-tone, big profit” income stream, then this guide will walk you through everything step-by-step. ⟵Why should I Crack The Amazing Monetization Code?